Cowboy Mouth are a collective of ’80s rock & roll survivors — musicians with slight new wave and alternative connections who have aspired to AOR stardom. Formed in the early ’90s after alternative rock had broken into the mainstream, the group fused AOR with alternative and roots rock influences on a handful of indie releases before signing with MCA Records in 1996. 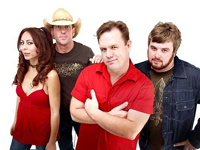 Although Cowboy Mouth had trouble remaining on a major label’s roster, the band has continued releasing material in the new millennium on a variety of imprints and indie labels. Paul Sanchez (vocals, guitar) had previously recorded as a solo artist before teaming up with Fred LeBlanc (vocals, drums). The pair formed the Backbeats, who were short-lived. After their breakup, Sanchez moved to New York, where he continued to perform solo. In 1988, he returned to New Orleans; LeBlanc, who had just finished playing with Dash Rip Rock, had Sanchez join his new band. The duo began jamming with Griffith (lead guitar, vocals), who had just left the Red Rockers, a new wave band who had a hit with “China.” The trio played with a variety of bassists until 1993, when Rob Savoy — the former frontman for the Bluerunners — joined the band. The band released its first album, Mouthing Off, late in 1993 on the independent Viceroy Records. Two years later, they released It Means Escape on the Monkey Hill label. new orleans’ rock at its finest!